How Do You Train and Prepare Yourself For A Marathon? Here are 8 Simple Ways! There’s a good chance that once in our lives we have attempted to join a marathon. Be it a beginner’s marathon, run for a cause, or expert or intermediate race, we’ve probably participated in one at some point. Expressing the desire to run in a marathon is perhaps due to several reasons. Perhaps it’s a personal choice, or we’ve been talked to joining by our friends, or we have taken on a weight loss challenge or switching to a healthy lifestyle, or just wanting to test our limits and go the distance. Whatever the reasons are, the planning preparations for undertaking requires motivation to maintain the momentum. Moreover, whether you are just a beginner or have attended numerous marathons, it is still important to prepare and make sure you stick to your training routine. Nevertheless, preparing yourself mentally is also just as important as preparing yourself physically. Below are eight ways to plan and prepare yourself before running a marathon. Since preparation is everything, it still matters what kind of marathon you are participating in. Marathons come in different courses. They can be low-key or basic, short distance or long distance on roads along the backcountry, or rigorous mountain ranges, or spectator-lined races in urban areas. Most of the time, races would usually indicate the routes and distances, so whichever you select would give you an inkling of what you’re participating in and plan your training. You can also begin your training plan by familiarizing yourself with the given race routes. Often, the motivation of continuing a marathon can be short-lived when we do not have a solid plan. When we dive headfirst without a proper strategy can lead to failure. Before starting, make sure you have a timetable to fit in your fitness schedule. You can squeeze in at least one hour during weekdays and add more during the weekends since you have more time. Not only that, but your timetable should also include healthy meal plans as well to guide you throughout your preparation. Generally, we would need all of the nutrition found in foods are vital when it comes to preparing yourself before and during the marathon. However, the two constituents that you need to stock up on are protein and carbohydrates. Loading up on protein means consuming healthy options like lean meat, soy, seafood, eggs, beans, milk, cheese, and yogurt. Also, loading up on carbohydrates should be healthy as well. These include whole wheat and grains, nuts and seeds, all kinds of green and leafy vegetables, fresh fruits like bananas, apples and berries. Just a day before the marathon, you can also pack some protein bars and eat a hearty and full breakfast. Take note: make sure while loading up on these kinds of foods that you are not allergic or have sensitive reactions. Doing this may compromise your chances of running a marathon. Part of an effective workout is to always begin with a warm-up and stretching. Before going out for your training run, make sure to do start with them first. Stretching and warm-ups help to loosen muscles and joints and prevent most injuries while doing sports. It should start off as gentle and slow until it increases the heart rate. However, doing warm-ups should take about 15 to 20 minutes at most. It should be just enough to get you going and ready. Moreover, stretching and warm-ups can help increase the supply of oxygen in your body and brain especially when the rigorous training begins. Performing any kind of tasks would always require a good amount of sleep. The same goes for preparing for a marathon. Athletes, in particular, need at least eight hours of sleep a day. It is because it can help strengthen our immune system, and builds stronger muscles and joints. Moreover, sleeping well also promotes faster recovery and gain the ability to sharpen your mental focus. Not only that but getting a good sleep also gives you all of the energy you need to keep going until you finish the marathon. Jogging and sprinting in preparation for the marathon is not enough. You can improvise your routine by including endurance and strength exercises. Endurance workouts would include cross-training like cycling, swimming, aqua running, or even skiing. This not only increases endurance but improves flexibility as well. Strength exercises, on the other hand, can help you build resistance and mobility of your different muscle groups. This is especially necessary when participating in a triathlon event. Common strength workouts that are effective for this include the ones without equipment like squats, planks, push-ups, sit-ups, curl-ups, hip extensions. During, after and before the marathon, staying hydrated is especially important for athletes. 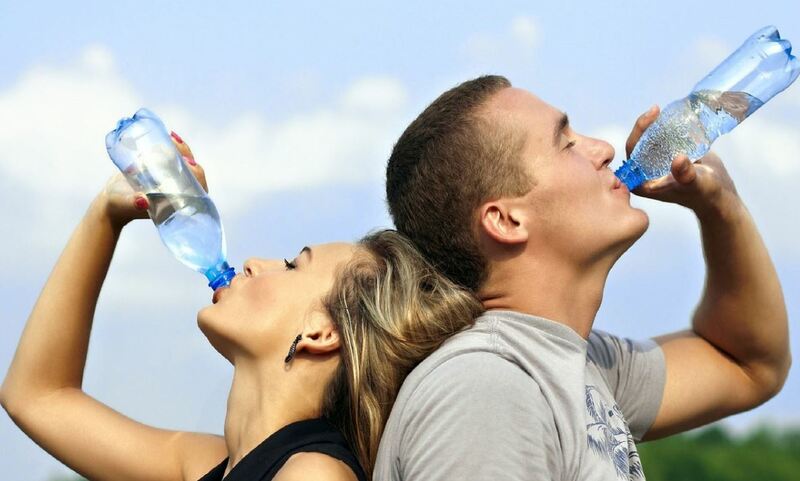 Drinking up helps increase the supply of oxygen in our body during rigorous activities. You can also pack up energy drinks for the marathon to replenish lost electrolytes during the activity. The suggested volume of water to drink is at least eight to ten glasses a day. Granted, eating the right foods can already provide all the nutrition we need in preparation for the marathon. However, adding supplements into the mix can ensure that you do not become deficient in certain vitamins and minerals that are needed for more running. Taking in supplements can also lessen our risk for diseases and injury as well as improve our immune system. Check with your physician before taking to make sure you get the optimal benefits. Supplements can be purchased over-the-counter or you can also highly rated ones online. Running a marathon will sound exhausting at first, but reaping the benefits overtime is worth it. Not only it can help you achieve your weight goals, but it also makes you stronger and healthier as well. So, sign up now! Next Next post: Why Do We Need Probiotics? Here are 11 Good Reasons Why!